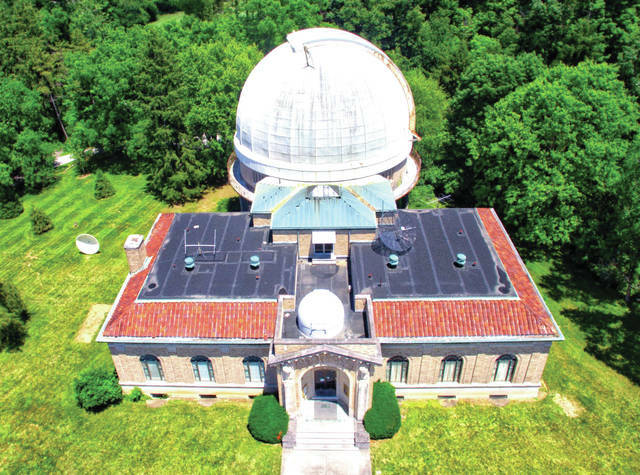 For three weekends in July, Ohio Wesleyan University’s “Place for Space” also will become the “Sun Spot” as Perkins Observatory hosts its popular “Celebration of the Sun” daytime skywatches. The special Saturday-only programs will be held at 4 p.m. July 14, 21, and 28 at the observatory, 3199 Columbus Pike (U.S. Route 23), Delaware. The “Celebration of the Sun” events replace the observatory’s Friday night skywatches for the month, when the sun sets too late to schedule evening programs, said Tom Burns, director of the observatory. Weather permitting, those attending the July programs will celebrate, discuss, and observe the sun using special telescopes and eclipse glasses. Perkins staff and volunteers will help guests to observe sunspots and solar prominences – explosions on the sun’s surface, Burns said. He cautions it is unsafe for people to look at the sun without the appropriate eye protection and supervision of trained astronomers. Other “Celebration of the Sun” activities may include rocket launches, sundial demonstrations, views of a 1,000-yard model of the solar system, tours of the observatory, and, of course, the Perkins ghost story, Burns said. “The sun is certainly worth celebrating,” Burns said. “It dominates our neighborhood, which we call the solar system in honor of the star (named Sol) at its center.… The sun makes up 99.9 percent of the substance of our solar system. Burns said he hopes to see guests at the observatory for July’s special celebration, which has special meaning for him. Burns became director in May 1992, and served as volunteer at the observatory for more than 10 years before that. Following July’s three “Celebration of the Sun” events, the observatory will return to its regularly scheduled Friday evening programs Aug. 3. On that date and throughout both June and August, the observatory’s Friday skywatches will begin at 9 p.m. Weather permitting, the skywatches will include observing the sky using the observatory’s 32-inch Schottland Telescope. Reservations are strongly recommended for all Perkins Observatory events, as many programs sell out. Advance tickets are $10 for adults, $8 for children (17 and under), and $8 for senior citizens (62 and older). Tickets are $2 more if purchased at the door. To reserve tickets or determine at-the-door availability, call (740) 363-1257. Founded in 1923, Perkins Observatory is an active research facility used by Ohio Wesleyan students and faculty. “The Place for Space” also conducts hundreds of public programs and welcomes tens of thousands of visitors each year. Learn more at www.owu.edu/perkins. Founded in 1842, Ohio Wesleyan University is one of the nation’s premier liberal arts universities. Located in Delaware, the private university offers more than 90 undergraduate majors.